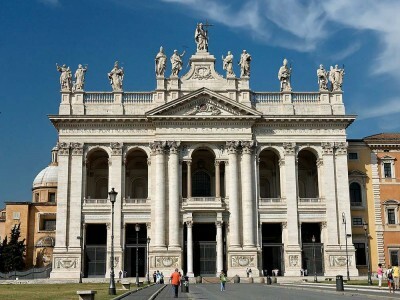 The Archbasilica of St. John Lateran is the seat of the Bishop of Rome. Although this refers to the Pope, the church lies in a part of Rome outside the Vatican City. However, it enjoys extraterritorial status and is considered to be Vatican property. The church is dedicated to Christ the Savior. The site was originally occupied by a Roman fort in the late second century AD. In the reign of Constantine, who changed the Roman Empire’s official religion to Christianity, it was given to the Bishop of Rome. It hosted a synod of bishops in 311 and was extended during the reign of Miltiades’ successor, Pope Silvester I. The building became his official residence, after which it gradually took on its later role as Rome’s cathedral. In 324, the basilica received its dedication from Silvester, who gave it the title of “House of God.” The papal throne was then installed, giving the building its official status as the seat of the Bishop of Rome. An inscription was added by the church’s main doors describing it as the “mother and head” of all churches not only in Rome, but in the entire world. The splendor of the basilica exposed it to attack during the barbarian invasion of Rome around the time of the decline and fall of the Roman Empire. The Vandals, in particular, caused a great deal of damage and removed almost all the church’s treasures in the fifth century. Several hundred years later, the devastating earthquake that hit Rome in 897 caused almost complete destruction. A new building, modeled almost exactly after the old one, was constructed on the site. This in turn was destroyed by fire in 1308, just before the moving of the papacy away from Rome. The building has been re-dedicated on two occasions. In the early 10th century, shortly after the basilica’s new baptistry had been consecrated, Pope Sergius III made a dedication to St. John the Baptist. In the mid-12th century, Pope Lucius III added a dedication to St. John the Evangelist. It is considered that Christ the Savior remains the primary patron of the cathedral, with the two Johns serving merely as co-patrons. Nevertheless, it became a very important shrine to those saints, and in later years a Benedictine monastery performed devotional acts to them. After the seat of the papacy had been transferred to Avignon, the basilica and palace fell into some decay, a process not helped by there being two serious fires during the 14th century. Even with the funds provided from Avignon to restore the buildings, some of their earlier grandeur was lost. When the papacy formally returned to Rome in 1378, the basilica was considered unworthy to be a papal residence. Instead, after spending time in two other basilicas in Rome, the present Vatican Palace next to St. Peter’s Basilica was constructed. Large-scale repairs were carried out in the 15th and 16th centuries. A quarter-century later, Pope Sisto V added the Loggia delle Benedizioni, or Lodge of Blessings, at the end of one side aisle. In 1645, Pope Innocent X commissioned Francesco Borromini to carry out further renovation works by the time of the following Holy Year in 1650. He was required to preserve as much of the ancient basilica as possible, and chose to erect five enormous archways, supported by central pillars, with 12 niches along their length. The niches were filled in the early 18th century by a number of statues of the apostles in a late baroque style. However, a more significant development came in 1731, when Pope Clement XII asked Alessandro Galilei, the winner of a competition, to design a new facade for the building. This neo-classical piece was finished in 1735, and it remains in place today. Both in Galilei’s own day and more recently, the facade has frequently been criticized for being more suitable for a royal palace than for a holy place of worship and the seat of a bishop.